Castleford Tigers have signed French forward Gadwin Springer from Catalans Dragons. Springer has signed a two-and-a-half-year deal, starting immediately. The 22-year-old former Toulouse player will arrive in this country on Monday. A junior French international, Springer made his debut for the Dragons against St Helens last year. 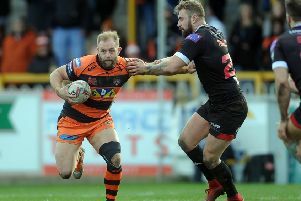 He has made three substitute appearances for Catalans this season, scoring his first senior try in a home win over Hull KR and featuring against Tigers at the Jungle last month. “Gadwin has shown this season what a great prospect he is and we are delighted to have signed a quality young prop who we believe will be an outstanding player for Castleford,” coach Daryl Powell said. “He is big, strong and aggressive, which are obviously key qualities for his position and the fact we can bring him in now is a bonus. Tigers chief executive Steve Gill said: “We had initially signed Gadwin for the 2016-17 seasons and when we heard he could be available straight away, we moved pretty quickly to make it happen. Gill added: “Getting Gadwin here sooner was made possible due to additional funds raised by the growing Tigers Daily Draw. “I would like to thank everyone who’s a member for helping to make it happen. “It’s a true thank you to our fans and shows our commitment to pushing on towards a top-four Super League spot. “I would also like to thank the Catalans Dragons for agreeing to release Gadwin early and the professional way they went about their business.